Bad behavior in children might actually be a good thing. Today I speak with investigative journalist, and author of The Good News About Bad Behavior, Katherine R Lewis. Katherine details where bad behavior comes from and how it can be used as a tool to help raise happier, healthier children. Dr. Michael Ruscio, DC: Hey, everyone. Welcome to Dr. Ruscio Radio. This is Dr. Ruscio. Today I am here with Katherine Reynolds Lewis, who wrote a book entitled The Good News about Bad Behavior. And I haven’t read this book. But I’ve familiarized myself with some of her work. And I thought this was a concept, a topic that some parents are probably really curious to know what someone who focuses in this area would have to say. Communication – doesn’t have to be centered on parenting and teaching. Ask them questions, find out how they feel about what they spend their time doing. Ask them how screen time feels? How does play help children? What is The Good News About Bad Behavior? DrMR: And so I’m really curious to look more into what the good news about bad behavior might actually be. So, Katherine, welcome to the show. And thanks for being here. Katherine Lewis: Thank you! I’m glad to be talking with you. DrMR: Same here. And I’d like to start us off with the story that might lay some of the groundwork for the conversation. I, of course, have a niece and nephew. And it’s very interesting to observe each one of their behaviors. And Gianna is like the little angel of the family. She’s very well mannered, and she doesn’t engage in too much rambunctious behavior, whereas, Anthony, he is just like a little wrecking ball. And he is just always moving. He’s always touching stuff. He’s always getting into things. And that behavior is not so much conducive to a classroom. But there’s something I noticed recently in observing their behavior, which is when we were outside with my brother, Anthony’s father, doing yard work, Anthony was nailing everything…I think there was one point, my brother forgot to follow a certain procedure for when you’re cleaning a lawnmower. And Anthony interrupted. And Anthony, I should mention, is only 3 years old. But he knew the procedures well enough to interrupt my brother, and was super engaged, whereas I look over at Gianna, and she could kind of care less. And so I couldn’t help but think maybe boys are put into an environment that’s not interesting them in the classroom. And this is where some bad behavior comes from. So I’d like to offer that story kind of as fodder for the conversation. And wherever you want to launch us into this, whether it’s with your background, and go from there, but wherever you want to launch us in, please, let’s dive in. KL: That’s so interesting. I love that story. And what a really engaged and observant uncle you are that you’re not labeling the kids, that you’re really open to seeing them in different ways. And I think that’s just something that all kids need, where they can be seen as bringing their own unique, positive attributes that may be challenging in some settings, but extremely useful in others. So, yes, I think that’s so common, not just boys and girls differences, but just kids in general. When they’re doing something where they’re engaged, where it happens to be an intrinsic interest, often when they’re working with their hands, and especially if they have a role to play where they can really contribute, that you will see even 3 year olds have this laser focus. And although he sounds like a remarkable little kid that he was correcting his dad! DrMR: He loves lawnmowers. He loves lawnmowers. KL: Aww. Right, right. All little mechanical things. Oh, my gosh. I remember at 2, my middle kid writing a little story about the mommy mini loader and the baby mini loader. They love all those mechanical things! So that’s a perspective that I’ve come to over the course of reporting this book. And I came at it in sort of this same perspective that maybe you started with when you first started talking about this, that our goal as parents is to have orderly homes, orderly classrooms, just keep these chaotic kids under control. And when my kids started elementary school, I volunteered in the school. I really wanted to be part of this civilization process, of turning the wild preschoolers into someday well-behaved fifth graders. And I still remember one of the first days of kindergarten that I was on the blacktop volunteering at playground time, at playground duty at recess. And my little kindergartener was playing with all the other little kindergarteners with their sweet, chubby faces and making new friends. And there were some giant fourth and fifth grade boys nearby kind of whipping basketballs and kickballs across the playground. DrMR: Right, probably something antithetical to what you wanted, I’m assuming? KL: Right, right. They did not say, “Oh, thank you, Mrs. Lewis, for pointing that out. We’ll stop.” They just kind of ignored me. So I figured, oh, they must not have heard. So I walked up closer. I used my big girl voice. I made direct eye contact. And it was like I was a ghost. And they just ignored me and kept on playing. And I started wondering more in earnest, what’s different about kids today? Why don’t they just do what we want? And that’s where my journalist brain kicked in and I started what ended up being 5 years of reporting and research looking at all the literature on kids’ behavior and what’s happening in their brains when they misbehave, what is effective in disciplining them. And I ended up writing about 4 different models of discipline that focus on teaching kids self-control, so really strengthening their ability to self-regulate. And in the book, I try to pull out, what are the common threads? And those are that they all focus on a connection between the adult and child, communication about the kid’s behavior or actions, and a focus on capability building, so building the kid’s social and emotional skills, and also their life skills. So like Anthony was really interested in fixing a lawnmower. That’s such a great example of how to engage kids and teach them to pay attention and learn the steps to a process and develop their executive function, all these really important things that we need kids to do. And I’ll just close this saying one of the most startling statistics that I came across was the National Institute of Health’s study that found 1 in 2 children nowadays has a mood or behavioral disorder, or substance abuse disorder by the time they’re eighteen. So it’s really much more common to have a challenge with self-regulation, whether it’s regulating your behavior, emotions, or thoughts. DrMR: And do you feel this to be, I’m assuming, in part, environmental, and then, in part, I guess you could say, the techniques that parents are using? Are these kind of the two main prongs to the approach? Is there another? KL: Yeah, I think it’s really…Well, first of all, I should just disclaimer that it’s impossible to prove because we don’t have a time machine to send a representative of sample of kids back in time to be raised differently. But there’s 3 big factors that have changed our society that impact every kid’s environment. And then, of course, there’s always the genetic factor. So those 3 big changes in our society are, number 1, the disappearance of childhood play, and number 2 the growth of screens and technology and social media. And number 3 the decline in the contribution, as I was talking before. Kids are really unemployed. They don’t have after-school jobs. They don’t have jobs around the house. They don’t have a role in their neighborhood or family or community where they are helping, where they are seeing the impact of their actions. And childhood has really become about performance, about achievements, which is great. We want our kids to achieve. But we also need them to be grounded with a sense of what they can do at 3 to help fix a lawnmower, or what they can do at 10 to help a neighbor get her walk shoveled, that sort of thing. DrMR: And I guess there’s also a selfish motivation there for the parent, which is put your kids to work. It may not be a negative, selfish thing because I could see some parents—I’m not a parent, so I am just drawing some inferences—but I can see parents thinking, potentially falsely, that by having their children do certain things that may not typically be considered desirable, they’re not allowing their kids to be kids. But it sounds like having your kids participate in, I guess, these activities of daily living, if you will—chores and such—is actually a good thing for them, kind of like, is it the Montesorri school that kind of teaches some of this self-reliance? KL: Right. And it’s really interesting when you look at the research on chores and happiness. It’s actually correlated. When we are doing helpful chores, we tend to have higher levels of happiness, even though it’s super counterintuitive. And if you go back to some other research, if you make your bed first thing in the morning, that gives you a little jolt of accomplishment. It was so easy to do. You immediately see how much nicer the room looks. It’s sort of like that with any small household chore with the caveat that there are some environments where kids are overburdened with household chores or tasked too much with watching younger siblings, especially in high-poverty or high-risk communities. That can be bad. You don’t want to tip the balance too far. But generally in an environment where kids have a choice between having their schedule overloaded with extracurricular activities and being shuttled from playdate to soccer to tutoring, the choice between that and having some free time for play and have some responsibilities to contribute around the house, the latter is much healthier for kids to have a role in their family where they really feel valued. DrMR: And as you’re saying that, I can’t help but just paint this parallel in my mind, looking at even an adult who doesn’t have much to do. And I think the—pardon my candor here—but the spoiled rich kid who’s a rich kid now who is eighteen and they never have to do anything. And they’re just not happy. And I’m sure some people can think of examples of this where the person, they had everything, was actually miserable because there must be something about doing stuff, even if it’s stuff that seems trivial that is hardwired into, I guess, this deep part of our psyche where we feel good if we’re doing things. And even if that thing is as small as making your bed, we need it. So, yeah, I think it’s a good way of looking at this. Kids need to do things just like adults need to do things. KL: Right. If you’ve ever been unemployed, it’s the worst feeling. Of course, kids who have no role in the household feel a little anxious or depressed or have some behavioral issues because they don’t have that way to contribute, a job where they feel really needed and that their actions have an impact. So, yeah, absolutely. Let’s talk about one of my favorite tests for digestive health, the GI-MAP from Diagnostic Solutions, who has helped to make this podcast possible. Now if you’ve been reading any of the case studies that I’ve published in the Future of Functional Medicine Review clinical newsletter, you’ve likely seen that this test, the GI-MAP, is a test I frequently use in my practice. DrMR: So, we talked a little bit about the decline in contribution. And then there’s also play and screens. Which one of these would you like to tackle next? Because I’m curious to dig into both. KL: Right. Well, let’s talk about play because we talk enough about screens. I think there’s a lot of negative press about social media already. So childhood play is so important. And I think, again, parents feel like there’s more value in the tutoring or the after school enrichment, when really play is the work of childhood. It’s how children learn social and emotional skills. It’s how they learn, “I push this little kid. He pushes me back. Everyone cries. We don’t have a fun afternoon.” That’s how they learn control and cooperation. And even abstract thoughts. So when a young child picks up a lump of mud and says, “Oh, this is a delicious cupcake,” and holds it out, “Do you want to try,” they’re developing abstract thoughts because they’re representing an idea with the object, the handful of mud. So it’s really important for kids in their normal, healthy development to have lightly-supervised, unstructured play, and outdoor play. And not only does it help to develop social and emotional skills, it also gives kids freedom, a little autonomy to take small risks and maybe stumble, scrape a knee, climb too high, get stuck in a tree, have to figure out how to come down. Those are all really, really important in building their sense of self-confidence so that they don’t later develop anxiety. And the study that I mentioned that found 1 in 2 kids will have a mood or behavioral disorder, anxiety is the highest one of those. So 32% of adolescents have an anxiety diagnosis. And it’s because, I argue in the book, that they just haven’t had the freedom to take small risks, to mess up, to get a little hurt, and discover that they don’t melt. They don’t dissolve. They’re okay. And they are resilient. And that’s the only way. There is no shortcut to developing resilience other than just experiencing setbacks. You can’t implant it in your child’s brain and heart. DrMR: Yeah, it’s something I’ve thought a lot about. And I notice that when it comes to children, I take a much more relaxed approach. And I hear the parents that—specifically my parents because I’ve had this conversation with them—“Well, it’s different when it’s your own kids.” And I don’t deny that. But I also don’t think it’s going to change my worldview in terms of I think that people tend to learn best by making their own mistakes within reason. Don’t let a kid meander by a 100-foot cliff. But let him potentially fall on the playground, kind of thing. And it sounds to me like there’s clearly a downside to an approach that…And I’ll use my brother as juxtaposition here. And he might give me a hard time after he listens to this. But the kids run off ahead of him. And he gets very concerned about that. And my thinking is, well, if one of them falls and gets hurt, they’re going to be more careful next time. And if you continually just stop them from running, you’re just hindering their ability to figure out how to run down the street. Within reason we want to stop them if there’s some chance for overt harm, like if there’s a traffic, busy street. Yes, okay. Step in. But we’re talking about a cul-de-sac that barely has any cars on it. And so it seems to me that this kind of less is more, I guess, approach is befitting. But for people who maybe struggle with that—like, again, thinking of my brother, he may have a hard time with that concept—is there anything additional that you would offer them to help them feel more comfortable about that kind of approach, or any other guidelines or specifics? KL: Well, I certainly would first start with expressing a lot of empathy and solidarity because I was 100% that parent where, when my kids were first learning to walk, I didn’t want them to fall down. When they were first learning to stand, I would prop them up with a little Boppy pillow so they wouldn’t fall over until I realized they will never develop a sense of balance unless you let them fall a little. And I think it’s because of this huge shift in our culture in the last 3 decades. First of all, there’s a huge increase in parental fear and this notion that our job as parents is to keep our kids safe 100% of the time, and the only way we can do that is when we’re physically watching them, that if they’re outside of our arm’s grip that they will somehow then come to some terrible tragedy. So I think that he’s just responding to the huge culture change that started in the 80s and 90s with playground accidents leading to playgrounds being padded, becoming really, really safe, and child abductions, which are very, very rare, leading to an entire generation of parents being terrified of letting their kids walk to school because of that. And I think the case I’m trying to make in the book The Good News about Bad Behavior is that we are now faced with a situation where parents don’t necessarily have the skills and tools at their disposal instinctively to give kids the guidance they need to be ready to do all those things that maybe thirty years ago were just instinctual. So we need to do more planning preparing, talking through with our kids ahead of time, and then let go. And that’s the part, I think, that helps parents like your brother and like me who were initially fearful of letting go is I’ve already talked to my kid about how to cross the street safely. I’ve already talked to them about coming to a stop and looking both ways and what they would do if some stranger talked to them. And then you have to take the next step, which is letting them practice because they cannot turn 18 and suddenly have these skills if they don’t practice them when they’re 7, 8, ten, fifteen, along the way. We have to always be increasing their circle of freedom. And, yeah, sometimes we increase it to far, and then we ratchet back a little bit. And just have that leap of faith that they’re going to be okay. And the final thing I would say is we are so afraid of all of these things outside of our kids’ bodies that are going to hurt them, the stranger, the car, the stumble and fall. And yet 32% of kids have an anxiety diagnosis. We’re not paying attention to the things in their own body that are lacking that they need to develop. So it’s that that we should pay more attention to and try to think, what are you doing every day to take a small risk, to learn something new, to toughen up, to develop resilience? DrMR: I love that analogy of teaching and then releasing, so to speak, so they can practice because everyone understands the value of practice. But when you put it in that analogy, it really makes it come to life in terms of teach these lessons to be safe, but then allow them to practice them. And, I guess, also part of that practice might be, “Don’t run on the gravel.” And then you fall on the gravel, and it hurts. It drives that message deeper into your limbic system, once you feel that little bit of pain. KL: Right. And you’re going to then pay attention to the gravel and not your annoying, overprotective parent. You’re setting up a situation where your child is grappling with life and not trying to get you off of his back. KL: And the third piece of that that’s also important for many kids is the reflection and processing and, “Oh, so what did you do? What did you try? How did it work out? What are you going to do next time?” Those 2 questions to ask kids when they come to you crying, as opposed to, “You shouldn’t have done X,” helps them to process it and use their critical thinking. And that’s the other piece that really helps kids to develop that sense of good judgment. DrMR: And isn’t that one of the important Big 5 personality traits? Is it introspection or something like that? I think that’s an important aspect of, I guess, having a healthy psychology, that ability to introspect and reflect. So this would be another life lesson that you’re teaching them in terms of take them home…When you walk away from the playground and “The other kids were being mean to you, did you maybe think to consider that you had the one toy and you didn’t let anyone else use the toy the entire time?” That’s fair game. And as you’re saying that, I can’t help but think that this parental fear might be self-perpetuating because you take this approach with your kids, and then your kids are going to have a higher predilection potentially toward anxiety, as you mentioned 32%. And then they’re going to be anxious parents, more prone to being overly with their kids. And so I could see this getting out of control very quickly. KL: Yes. And I think that’s already happening because these trends have been going on for 30, 40 years. And so, young millennial parents who have struggled to manage their own anxiety and moods are now in the role of teaching their kids. And that was another really important thing my research found is that we are always communicating to our kids, whether verbally or subconsciously: fear, how to respond to fear, confidence. Even children pick up on our breathing rate and our heartbeat. And so until we can learn to manage our own emotions, we cannot be as effective as we should be in teaching our kids to manage theirs. And it’s not to stigmatize or demonize adults who have an anxiety diagnosis or depression or anything, ADHD. It just means that we all have to view ourselves as having a mix of neurological things that we’re dealing with that bring us some wonderful opportunities to be creative or to be alert, to be vigilant, and also have aspects that we need to learn to manage. And, in fact, sometimes an adult with anxiety can be the best guide for a child with anxiety because they’ve tried the whole suite of meditation, mindfulness, breathing, exercising. They know what are the choices out there. And they can help kids discover what helps them to manage their fears best. So it really is something I think we as adults need to reckon with ourselves when we become parents, to really be honest about, “What am I bringing to this? And how can I be the best parent by modeling a healthy response to my own fears or my own narratives in my head?” so that we can really help our kids to take a leap forward and not be stuck with the same tapes that we are struggling with. DrMR: Sure. That makes complete sense. And as you’re saying that, I’m thinking more about play. And I’m wondering if to a degree play, perhaps, is easier said than achieved. And I think about this book that I bought called Playborhood. I haven’t read it. I am accruing books that I come across, yours included, for when I have kids or will be nine months away from having kids so I can have a reading list to get me up to speed. 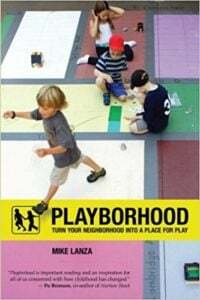 And there’s this one book called Playborhood that essentially laid out, as I understand—again, I haven’t read it yet—but lays out some tips and guidelines for creating a neighborhood that’s centered around play. So that’s where Playborhood comes from. I could see the challenge being if every other kid has their nose down in an iPod or a screen, then you send your kid outside to play and there’s no one out there. It’s like a ghost town. DrMR: So do you have any thoughts on how we tackle that? DrMR: Oh, thank goodness. So there is hope. KL: Yeah! So it just requires us to be brave as parents and to really be willing to go in the face of the culture a little bit because we can either be that virtuous cycle of positive change, or we can be that vicious cycle of everyone becoming more fearful and judgmental of each other and pointing the fingers instead of trying to make a positive change. It can take time. So often I was an outlier in my neighborhood. And some of my neighbors thought I was kooky. And then a year later, their kids were a little bit older. They’ve had more experience as parents. And they were much more willing. And now we have, I think, 5 or 6 different families that have a lot more freedom with their kids and let their kids run around to each other’s houses. So there’s a combination of figuring out that ground, but also being patient if people aren’t quite there yet and not judging other parents for being protective, just as you hope they won’t judge you for being more free. DrMR: Sure. That’s a great point. And I’m assuming with little kids that if they could choose between sitting there somewhat solitary with your phone or your device or go play with other kids, I’m assuming that once the option is presented, like you just alluded to, that most kids are going to gravitate towards playing with other kids. DrMR: But rather than saying, “Don’t do this,” you present them with a more attractive alternative. So I would assume it would make them easier not disciplining them out of one thing, but rather you’re giving them something that they want more. And they intrinsically choose to play more and be on devices less. KL: Yes. And actually that’s the perfect segue to the second of the 3 factors we talked about, which is the growth of social media and screens. And, yeah, younger kids especially are much more liable to want to go and play with other kids and play outdoors. And I’ve even seen a parent kind of shoving an iPad at a kid who was really just happy looking around, engaging with the world. So if we can catch them young before they get in the habit of always being on a screen, that’s ideal. But even with those middle grade, elementary school kids, if you have a discussion as we do in my home and as I advise parents to do, like what’s a healthy amount of screen time, how do we manage it, and then stick to those limits, then after they’ve used up their 30 minutes or whatever of daily screen time, they probably will get a little bored and start looking for people to play with. So even if kids are having that pull to Fortnite on the iPad or the PS2 or whatever app or Instagram that they’re obsessed with, as long as parents are willing to draw a line, then they will be looking for ways to entertain themselves. And it doesn’t have to be outdoors. It can be really creative building play with other friends. There are lots of other ways that that can happen. DrMR: And I’m assuming this is much harder to achieve directly with teenagers. But rather the better strategy might be to inculcate this in children, and then they’ll have this more balanced view on play and interaction with other kids and have less of this reliance on devices. And then they can carry this into their teenage years. But is there any sort of approach that works well for teenagers? Because I see that as probably being the most difficult group to reach because you’re a teenager in that rebellious phase already. So it must be much more difficult to circumnavigate that. KL: Yeah. It can be. It really just depends on the teenager. And here is where I think I go back to those 3 elements that I found in all the discipline strategies I looked at, which are connection, communication, and capability building. And connection is so important with our teenagers because in so many ways, it’s really intuitive. But little kids you connect by cuddling, by playing, by singing, all the physical play that we do with our little kids. And sometimes when your kids are 13 or 14, you think they don’t need that. But they need that physical connection with you. They may not take you up on the hug often. But you still need to offer. And it may look different. It may be a walk around the block. It may be a game of tennis, but having regular ways that you’re connecting with your kids that are not about problem solving or discipline issues or limits. That is the foundation to build everything else on. So they can start to notice, “Yeah, I feel pretty bad when I’m looking at everyone else’s fun weekend party pictures, and I’m sitting here alone.” “Maybe don’t use Instagram on the weekends. Or limit it.” And so they start to have a bit of a feedback loop that they can carry into adulthood. And with teenagers, it’s really important to also be pushing them to independence because that’s what they want. And as long as you tie the independence and the freedom to the responsibility they demonstrate, they will be on the same page as you. “So, yes, I want you to have the car. Here’s what I expect. What do you think is reasonable to demonstrate that you’re ready for that privilege.” Or, “You want your cell phone in your bedroom,” which we don’t allow with my 12 and 14 year olds yet, “then this is what I expect to see before you can have that privilege.” And you can always try it and then reevaluate and then maybe pull back on some of the privileges if it’s not working out. DrMR: That makes a lot of sense. And I’m taking notes here as we talk. What were the 3 key to effective discipline? Was it connection, communication, and community building? KL: Capability building. So I wanted to keep it alliterative. So not only social and emotional skills, but also the life skills that really give kids that deep sense of confidence. DrMR: Gotcha. Gotcha. What about boredom? One of the things I’ve heard discussed in the context of screens and constant screen use is it detracts from boredom. And boredom can be good for creativity. It can be good at stimulating you to play and connect with others. Do you have any thoughts or did you want to cover any research on boredom? KL: Yes. Yeah, this is a really important point because our kids aren’t bored. They’re not able to be bored because they’re always being entertained. And so many creative people talk about that’s the time when they come up with their best ideas, when they’re just zoning out or they’re on a long walk or they’re in that state where they can really just think. And I think it’s something also that’s really missing in kids’ lives is the ability to tolerate some boredom because there’s so many entertaining things. We’re always pushing things into their hands, into their attention. So I think it’s good. And that’s why a lot of kids will go away for summer camp. And it’s great to have screen-free time when they just have to figure out their own fun or go to the beach for a day when there’s nothing to do but make sandcastles and play in the waves. And it’s such a foundation for play and creativity. And, as you say, I think we need more of it in our lives. DrMR: Yeah, I think parents—again, I’m not a parent—but parents have to be careful about how quickly they use a screen as a pacifier because then…I just look at some kids who, every time I go out to a restaurant, there’s a kid on a screen. And I get there’s a time and a place. But I could also see it being a very slippery slope where they just can’t be bored. They just can’t sit there around the table without some kind of device. And you very quickly train them to always need this stimulation. KL: Right. Right. And I really sympathize with parents today because my kids were toddlers before there were iPads. So I didn’t have a choice. I had to figure out other strategies. I don’t know if I would have if I hadn’t had to because it is so awful to have a toddler meltdown. So many of us would just do anything. So as often as we cannot hand them the screen, count that as a win. And as you building your child’s tolerance for those bored emotions or uncomfortable emotions. Or whatever they’re experiencing, letting them tune in to that and just know that it’s okay and everyone feels uncomfortable or bored or scared or hot at some time. And we’ll be okay. So, yeah, look for more ways for our kids to get practice doing that. DrMR: And, Katherine, as we’re trying to wrap this all up in a bow—and I think we’ve already hit on a lot of these—but is there a short answer or an answer that you would like to deliver in terms of when people ask you, “What is the good news about bad behavior?” are there a key couple of items there that you think people should really focus on? KL: Yes. So it’s sort of 3 layers. So the good news about bad behavior, first of all, is that it’s a totally normal part of how kids are growing up. It’s not a sign that you failed as a parent or that your kid is out of control and they’re going to be living in a van down by the river. It’s our new normal. KL: And then it’s a sign to us as parents, “Oh, okay. I need to pay attention. My kid is missing some kind of skill here. They need better frustration tolerance. They need better emotion management. They need to figure out how to transition. Or maybe this was a bad environment for my kid and they need more time to warm up before I bring them into a huge birthday party.” So it’s a signal to us to pay attention and problem solve with our kids about what they need so that they can be successful and develop those skills. And then the big-level good news is in the book, which is there’s so many road tested, research-backed models of teaching kids self-regulation. So 4 of them that I write about in the book, but I try to universalize it so that people can really pull out what works for them, and also to judge other strategies by these basic principles to see if they might be a good tool in your arsenal. And the model that I looked at—2 in schools and 2 in homes—have been around for decades. And the neuroscience is now catching up with what the behavioral scientists have really known for a few decades about the importance of play, about learning in context of developing kids’ self-control through games, that sort of thing. DrMR: That’s great that you have specific examples because I’m sure the more specific of a guide you can give a parent, the easier the application is going to be. DrMR: And was there a third layer? Or did I miss the third layer? KL: No, I guess the first is that it’s normal. The second is that it’s like a signal to you to pay attention; this is something you need to troubleshoot. And then the third layer is just there’s so many options for parents. There’s so many guides and so many resources for teaching our kids self-control. As long as we use that lens that our job is not to control our children, it’s to help them learn self-control. DrMR: Well said. Well, the book, everyone, is The Good News about Bad Behavior. Katherine, is there anywhere else you’d like to point people? A website or social media handle? KL: Sure, thanks for asking. My website is KatherineRLewis.com. I always love to hear from readers or listeners. On twitter, I’m KatherineLewis. On Instagram it’s Katherine Reynolds Lewis. And Facebook is Katherine R Lewis because they weren’t all available. So I did the best that I could. DrMR: And the book The Good News about Bad Behavior is at Amazon? Bookstores? Where can people try to get that? KL: It’s available anywhere books are sold, also on Kindle eBook and audiobook. DrMR: Awesome. Well, this has been a really great call. Thank you so much for taking the time and for doing all the hard work and going through the research and compiling everything into a book for people. KL: Oh, my pleasure! And thank you for everything that you do to support people in living their best lives. And good luck to you. I hope you have some good reading when you get to this point of fatherhood. DrMR: Oh, we’re getting there! All right, Katherine! Well, thanks again. Have a good one.